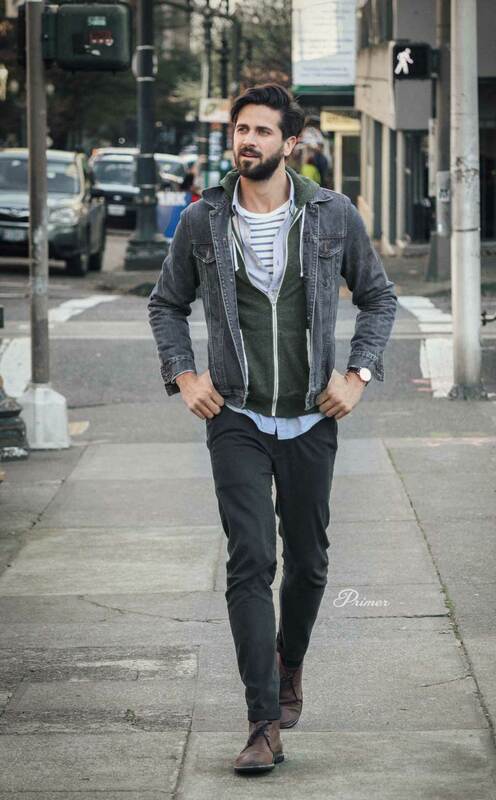 With parts of the country still seeing sub-fifty degree temperatures when the sun isn’t high, it’s smart to wear multiple thin layers – and it looks pretty sharp too. 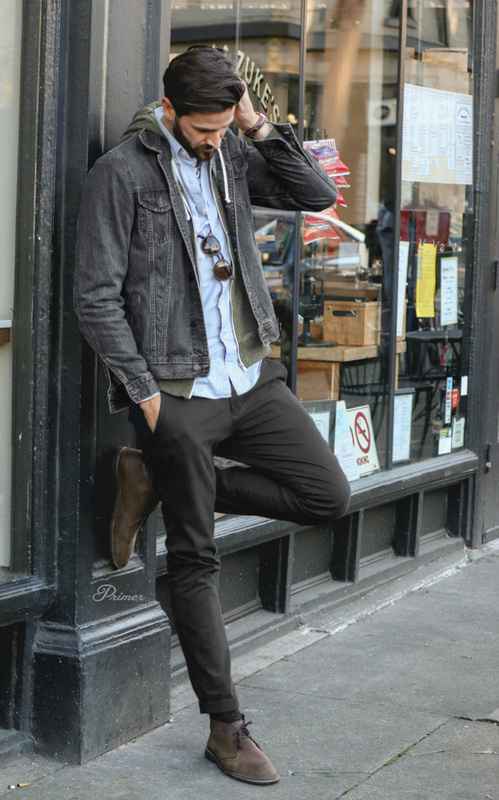 If you like this look, please share it with the buttons below! I get the sentiment here, but it is still in some parts of the South. It’s 53 degrees where I am in Tennessee right now. I really like this simple getup. 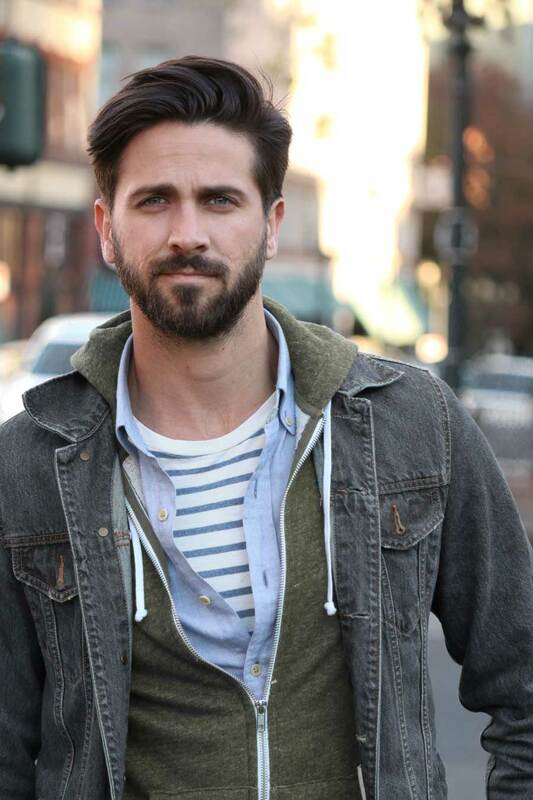 I’ve been looking for a Breton shirt for a while now, and an easy getup with chukka boots and a hoodie would be perfect for a weekend. Does anyone have any brand recommendations for a Breton shirt? hey Zac, are you looking for something different than the Old Navy option? Unfortunately in the U.K we don’t have Old Navy only Gap. So I’m looking like you said for the same shirt but from a different brand. Shane, do you have any tips for the fit of a short sleeve shirt? I’ve tried sizing down but I can’t seem to stop billowing shirt sleeves. Is it because your arms aren’t filling them in? I don’t have any advice on size but just a couple of options may be to do a couple of push ups (you’d be surprised by the difference in circumference you get from 10-15 pushups a day) or of course tailoring it. Also, I’ve had success with Banana Republic short sleeved tees, they seem to have a more “athletic” fit and sit more snug with my upper arms. Thanks Ebsan, will definitely continue doing push-ups and trying some new stores to get a better fit. I’ll have to give BR a look. I don’t have a store near me only a Gap unfortunately but when I’m in a bigger city I’ll have to check it out. For me it has to do with brand/fit. Less fashion forward stores have sleeves that jet out at 45 degree angles. Thanks Andrew, I saw last summer you bought some polos and short sleeve button ups from Uniqlo. How’s their fit? I have a store quite a distance from me so I don’t have the luxury of trying all their clothing on at once. The one I have from the Michael Bastian collection (which I don’t think they have anymore) has a great, slim fit. In general that’s been my experience with the Uniqlo line. Uniqlo fits are typically all over the place for me, but when it comes to short sleeve shirts, I only have experience with their Theory collection. The sleeves are good on them, but the shirts are really small and tight. I would suggest getting tshirts that are more sheer and/or have a flex fabric blend in them, usually geared toward fitness wear – they tend to have tighter arms. Great advice, but I think Zac is asking more so for short sleeve collared button up shirts. Thanks Toro. I’m not too sure I was entirely clear. I was just wondering about short sleeve button up shirts. I should have mentioned that in the initial post. I have the same problem and don’t really have a great answer. However, I find better luck with brands geared more to teenagers and younger men. I can’t say that any brand has been reliable for me consistently, though. Great Getup! I think this is great for my Minnesota “Springs” as well as the Falls! 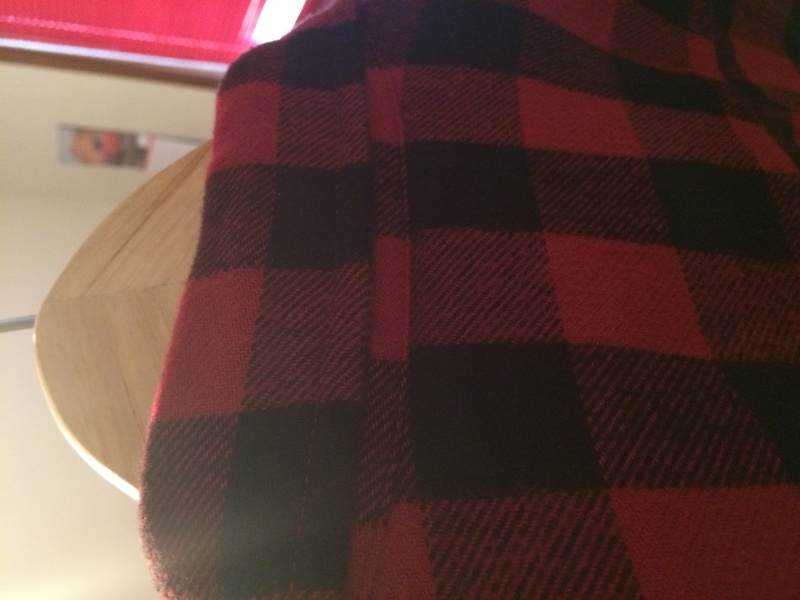 I was wondering if anyone had any advice on how to make the collar on my casual shirts lay flat in the back so they cover the entire backside of the collar and avoid the collar roll up in the back? Hey Ross, glad you like it! Could you elaborate more, in having a hard time picturing what you’re describing. Ohhh interesting. I’m usually able to flip the collar up, stick my thumbs underneath and fold it back into place. Another thing that is important, if your collar is button down, you need to unbutton while washing/drying. Andrew, any suggestions on the length of the button up shirt? I tend to have the shirt ride up whenever I stretch or lift my arms. Should I be buying the tall fit of my medium button ups? I’m only 5’10” so I’m not sure what I should be doing any thoughts or ideas? Or is the shirt riding up normal? Andrew I posted a photo from one of my casual flannel button ups. As you will see the back of the collar rides up exposing the underside of the collar that has would like to cover up. Any suggestions how I can prevent these collars from rolling up into a semi popped collar? I am not a big fan of the layered look except when i am backpacking. The layered look otherwise reminds me of a homeless person who wears all the close he has because he has no place to store them safely. I used to see a homeless person daily on the corner of Canal Street and Broad Street. Regardless of the temperature, this person had on several layers of clothes. The memory is recalled every time a layered look article. The exception is if the article is about backing in the mountains. haha! Interesting! 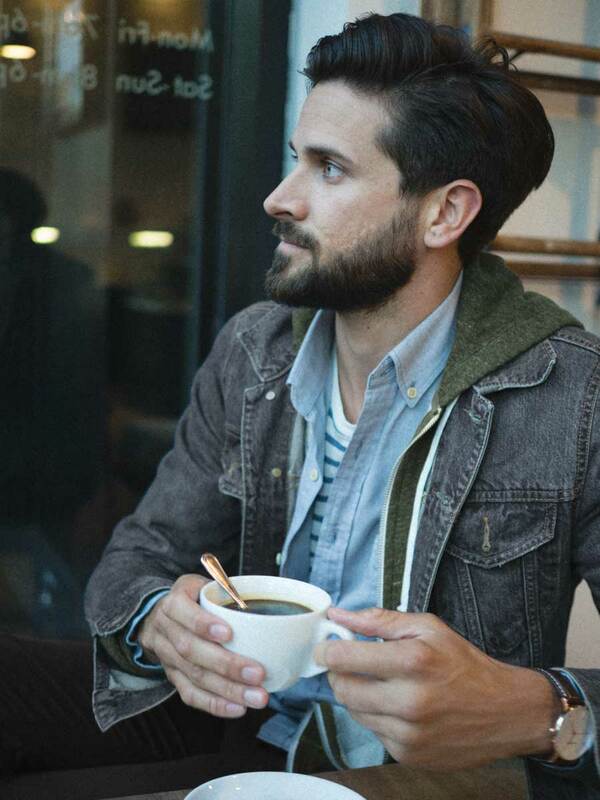 I suspect that’s just a personal thing for you, layering is an integral part of men’s style. My slim fit Old Navy short sleeve shirts and desert boots are a spring staple, as long as its not too warm for long pants. Any advice on what footwear to wear with the short sleeve button-down when paired with shorts? When I want to “dress up” a pair of shorts I usually go for a leather driving-moc, but those aren’t always practical. People, you don’t have to wear it RIGHT NOW. Every article, someone comments, “Here in X, it’s 1500 degrees – you’d roast/freeze.” Just keep the idea for when it is hot or cold enough. Nice collection a perfect pacakage of collection for spring. Its look really cool and handsome. Thanks for sharing.